Gucci is a four-month-old shih tzu mix, currently living at the MSPCA Nevins Farm shelter. In his previous home, someone dropped him, and he suffered a serious leg injury. The surgery for his injury was very expensive, and his owner could not afford it, so he came to the shelter. 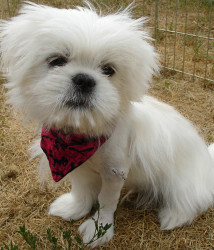 Because of the expense of the surgery, Gucci's adopter will need to pay the adoption fee plus the cost of the surgery. But you can help! Even if you cannot adopt Gucci yourself, you can make a contribution to the cost of his surgery, which will reduce the cost to his adopter--thus speeding the day that Gucci can be adopted and go to the loving forever home he deserves. Can you help? Even a few dollars will make a difference for Gucci. See Gucci's Petfinder page for contact information. Every pet owner knows that in the event of fire, our pets are at even greater risk than ourselves--more likely to panic and do the wrong thing, and also generally much smaller and therefore more vulnerable to being overcome by smoke. But while fire departments are well equipped with oxygen masks to help rescue humans, they usually have nothing similar for our pets. Because of this, The Greater Derry Humane Society, the Derry Public Library, and Windham Animal Hospital are raising money to donate pet oxygen masks to the Derry Fire Department. 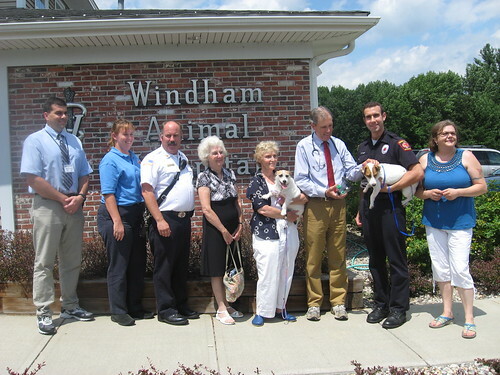 On Wednesday, Windham Animal Hospital and The Greater Derry Humane Society presented oxygen masks to the Derry Fire Department. 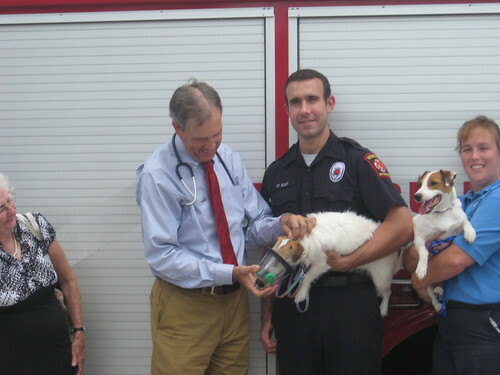 Dr. Butterfield did the research to identify the best pet oxygen masks to purchase, and Windham Animal Hospital donated several masks in three different sizes. With the masks being purchased and donated with funds raised by the Derry Public Library and others, pets in Derry will have a much greater chance of being rescued in the event of a fire in their homes. Therese at PetSitUSA caught this announcement of a recall of Merrick Beef Filet Squares Dog Treats for possible salmonella contamination. This is the second time Merrick has recalled these treats for salmonella contamination, although the FDA is annoyed that the first time, Merrick didn't tell consumers about the salmonella contamination. If you use these treats, please read the announcement and check lot numbers on whatever you have in the house. Natural Balance has also recalled its Sweet Potato & Chicken Dry Dog Food, also for possible salmonella contamination. UPG (United Pet Group) has recalled dog nutritional supplements sold under a variety of names. If you use supplements for your dog at all, click the link and make sure your supplements aren't on the (long) list. And finally (for the moment, as far as I'm aware), Feline's Pride has recalled its Feline's Pride Raw food with ground bone for cats and kittens, Natural Chicken Formula. For those of us with pets, life has not been the same since the massive, widespread pet food poisonings of 2007. We need to remember that no brand, price level, or quality level of food is immune to problems, and we need to remember that most companies deal with this as a business problem, and try to minimize the damage to themselves, rather than dealing with it as a threat to our pets, and trying to minimize the damage to our pets. 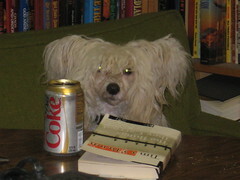 And since pet food recalls are not "news" unless they happen on the massive scale of 2007, we need to be alert, and include in our news sources the ones we find to be reliable. 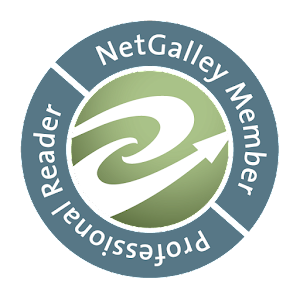 The Pet Connection is a great one, as is PetSitUSA. You can check the FDA Recalls, Market Withdrawals, & Safety Alerts site regularly. And above all, just be aware of how your pet reacts to his or her food. If a pet starts refusing something they've always liked, they may be ill--or there may be something wrong with the food. Never ignore what your pet is telling you! Hopefully there'll be no more bad news this weekend, and we can all enjoy the Independence Day weekend!